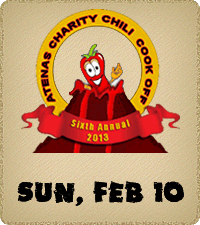 This year’s Chili Cook Off will be on February 10, 2013 and seems to have become an annual event. I seldom promote this kind of stuff, but in this case, the organizers are honest and the money goes to the Hogar de Vida, a home for abused, abandoned and orphaned kids that houses up to 35 children ages birth to 10 years old. Good cause. I could not go last year… some conflict as I recall, but it is on my calendar for this year. Give it a shot! I am sure that Diet Chili is available for those of us calorically challenged.